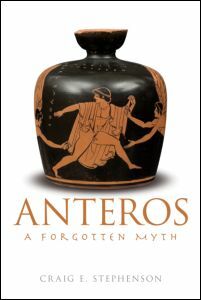 This coming Tuesday, December 2nd, Dr. Craig Stephenson will give a free public lecture on his book Anteros: A Forgotten Myth. About the speaker: Craig E. Stephenson, Ph.D., is a graduate of the C.G. Jung Institute Zürich, the Institute for Psychodrama (Zumikon, Switzerland), and the Centre for Psychoanalytic Studies, University of Essex. He is the author of Possession: Jung’s Comparative Anatomy of the Psyche (Routledge, 2009), editor of a collection of essays titled Jung and Moreno: Essays on the Theatre of Human Nature (Routledge, 2013), and the translator of Luigi Aurigemma’s book of essays, Jungian Perspectives (University of Scranton Press, 2007). He has lectured at the Bodmer Foundation, Geneva, for the Philemon Foundation and at the Warburg Institute, University of London. 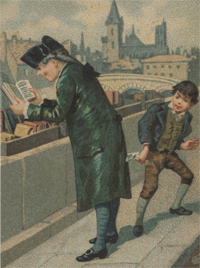 The talk will take place in Rare Books and Special Collections, 4th fl. McLennan Library, 3459 rue McTavish, Montreal. All are welcome. Please RSVP to jillian.tomm@mcgill.ca. Arthur Lismer lived and worked in Montreal from the 1940s until his death in 1969. A founding member of the Group of Seven (with Franklin Carmichael, Lawren Harris, A.Y. Jackson, Franz Johnston, J.E.H. Macdonald and F.H. Varley), Lismer dedicated his life to art education. Still relatively unknown and with little teaching experience, Lismer began his career as Head of the Victoria School of Art (today NSCAD University) 1916-1919. From Halifax, he spent the next 20 years in Toronto, first as Vice-Principal, Ontario College of Art (OCA) and later as supervisor of art education, Art Gallery of Toronto (today Art Gallery of Ontario). He moved to Montreal in 1940 to join the Art Association of Montreal (today the Montreal Museum of Fine Arts), where he established the MMFA School of Art and Design as one of the premier Canadian art training centres. Lismer joined the McGill School of Architecture as a sessional lecturer in 1943 at the invitation of John Bland, the School’s director, and was appointed assistant professor in 1945. There he taught: the History of Art and Theory of Design; Freehand Drawing; and led the Sketching School with Gordon Webber. 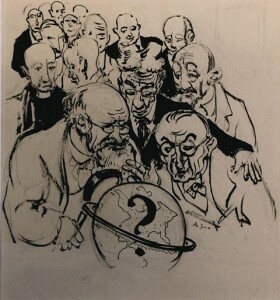 Lismer retired from McGill in 1955 at the age of seventy. 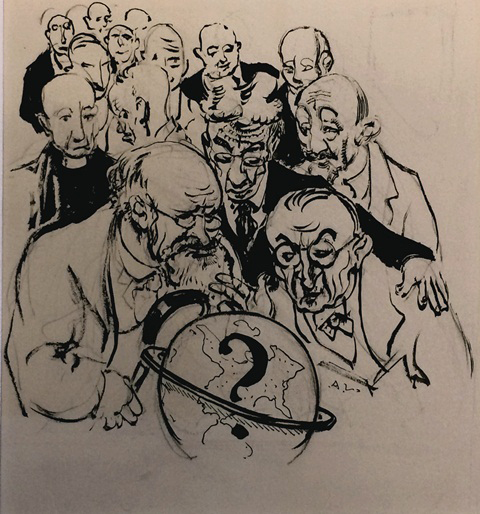 Rare Books and Special Collections, McGill University holds some 30 sketches by Arthur Lismer, executed between 1940-1969, during his McGill tenure and into his retirement. 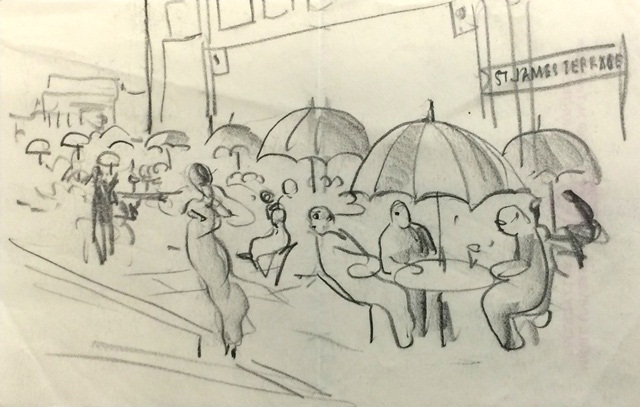 Lismer sketched throughout his life, filling dozens of sketchbooks, but also captured the world and the people around him on scraps of paper, in the margins of flyers and programs, and on paper napkins. 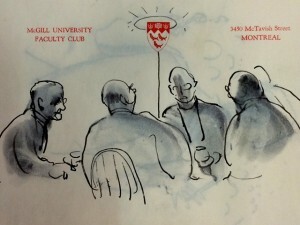 The McGill sketches originated primarily in the Faculty Club, where Lismer stopped most days en route between the campus and his office at the museum. 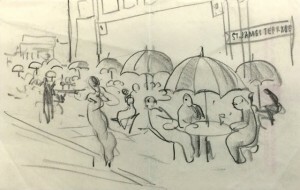 Many drawings are annotated by Richard Pennington, University Librarian, with whom Lismer dined regularly. Additional McGill sketches, of and by Lismer, hang in the Faculty Club. These are part of the McGill Visual Arts Collection, which also holds several Lismer paintings. Caricatures drawn on the plaster walls of the Arts Building East Wing, before renovations, are also documented in the McGill Archives. On view in the Rare Books and Special Collections Reading Room. Extended to 1 March, 2015. 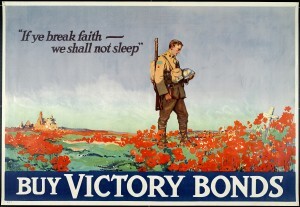 Exhibition opening today, November 11, 2014: The Patriotism of Death: Propaganda posters from WWI at the Montreal Museum of Fine Arts, Graphic Arts Centre, Jean-Noël Desmarais Pavilion. Read more about our collaboration with the Montreal Museum of Fine Arts and about McGill Library & Archives events commemorating the centenary of the First World War here. “This particular edition of L’évangile de la raison was published in Year 10 of the French revolutionary calendar, a date which corresponds to either 1801 or 1802. It’s a compilation of previously published works, assembled and edited by Voltaire, and includes many works written by him. Several editions of this compilation exist; indeed, the J. Patrick Lee Collection also holds a 1765 edition of the same title.